Now, if one looks at global politics and geopolitical tensions, with the global economy, and the mega trends - climate change, the movement of people, digitalization - the truth is that they are more and more interlinked, interfering more and more with each other. And indeed the problems are global but the responses are fragmented. Looking at the global economy - we are now growing still with a relatively acceptable GDP growth, 3.1% last year, but slowing down; and everybody agrees that there are dark clouds on the horizon, and there are risks. And if one looks at the risks, there is really an interrelation of those risks with all the other aspects of global international relations. Then we have the instability in financial markets, and clearly it's a matter of confidence, so political events have an influence on that; and if one looks at the shutdowns and the Brexit saga, there is a certain sense that political systems do not know exactly what to do when dealing with problems that have strong economic impacts. And so that is a factor of lack of confidence and a factor of lack of confidence creates or increases instability in the markets. And then the climate risk, and I think the climate risk is the most important systemic risk for the near future. I believe we are losing the race. Climate change is running faster than we are. And we have this paradox: the reality is proving to be worse than scientists had foreseen, and all the last indicators show that. We are moving dramatically into a runaway climate change if we are not able to stop it, and at the same time, I see the political will slowing down. This when technology is on our side and we see, more and more, the business community ready to respond in a positive way, and the civil society more and more engaged. But the political will is still very slow, and we see lots of subsidies to fossil fuels, we see carbon pricing in a very limited way, and we see many still putting into doubt whether climate change is a threat. But in my opinion, it's the most important global systemic threat in relation to the global economy. Then we have aspects that are more complex. It's true that globalization, with all its fantastic improvements in the world, and the technological progress linked to it, has increased inequality at country level, especially inside countries. And there are people that were left behind - people, sectors, regions - that has created a sense of frustration in the rust belts of the world. And this has been a factor in reducing confidence - confidence, trust in governments, in political establishments, and in international organisations like ours - and this also makes it more difficult to have effective strategies in dealing with the economic problems. And then, the fact that growth has been uneven, and that we have a number of least developed countries in which per capita growth is stagnant; this is creating development gaps that are a factor of instability and of conflict linked to other risks - violations of human rights and other aspects. And so this unevenness in growth is a factor of potential increase in conflict, and countries that are able to solve conflicts are always at risk of going back into those conflicts. Then if you look at the political mega trends, it is clear for me that we are witnessing a multiplication of conflicts - more and more interrelated and more and more related to a threat of global terrorism - but at the same time the response is more and more fragmented. We no longer live in a bipolar or unipolar world, but we are not yet in a multipolar world. We are in a kind of chaotic situation of transition. Polar relations have become unclear. The relationship between the three most important powers - Russia, the United States and China - has never been as dysfunctional as it is today. And this is true for the economy, but it's also true in the paralysis of the Security Council in many very important aspects. We see the emergence of medium-sized powers that start to be very influential in different scenarios. It's impossible to look at what happened in Syria without recognising the role of Turkey, Iran, Saudi Arabia. We can do the same in other conflicts around the world. So power relations are becoming unclear. Fragmentation of actions. Impunity and unpredictability prevailing. And when you say - and you said and it's right - that we are probably moving into a multipolar world, multipolarity might be a factor of equilibrium but it's not necessarily a factor of peace and security. We had a multipolar Europe before the First World War, but in the absence of multilateral mechanisms of cooperation and governance we had the First World War. So it is very important to recognise the importance of multilateral mechanisms. And if I could go with the mega trends that I mentioned - climate change, the movement of people - that today become a political problem, or the questions related to the utilisation, we would see in all of them more and more linkage within politics, economy, technology, movement; all these situations more and more interlinked, and then an enormous difficulty of the international community at the country level and at the global level to respond in a global way. And this brings us to the centre of the debate today. I am a multilateralist. 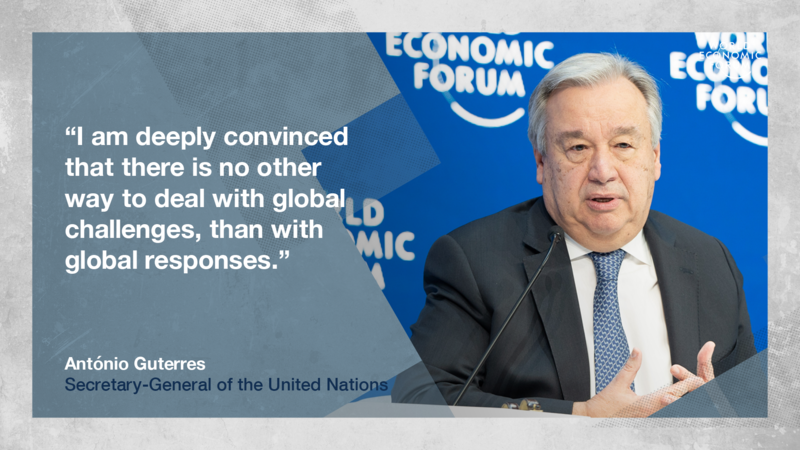 I am deeply convinced that there is no other way to deal with global challenges, than with global responses, and organised in a multilateral way. But I think that it's not enough to say this. And it's also not enough to vilify those that disagree with this and just consider them as nationalists or populists or whatever. I think we need to understand the grievances and to understand the reasons why - the root causes of why large sectors of the population in different parts of the world today disagree with us. And we need to address those root causes and we need to show these people that we care for them. And the problem is that to a large extent, political establishments and international organisations, during large periods, let these people be left behind in those, as I mentioned, rust belts of this world and did not show that they cared. And people would think "Oh politicians, they just take care of their own interests and the elections and whatever, and we are here. We are abandoned, we don't see a future, our jobs are lost, we can't rebuild our lives. We feel insecure with everything that has happened." There I must say, I think we are doing things. I mean, look at December last year. We were able to bring together the international community in Katowice. Everybody thought that would be a failure. It was not. We managed to approve the world program of the Paris agreement. It doesn't solve the problem, we need more ambition, more ambition and mitigation. That was not solved there, but it was possible to bring together countries that were in a totally different position, to at least agree on the basis to move forward. Nobody believed that it was possible to have an agreement, a first agreement in Yemen. It was possible. It will be very difficult to move, but we are pushing for a surge in diplomacy for peace and many other situations have been improving in recent times. South Sudan is looking better. Ethiopia -that is not our merit, it is the merit of the Prime Minister - has done a fantastic step forward in relation to Eritrea. A second aspect that I would like to underline on this is the fact that, in the humanitarian world, the UN still represents more than half of the humanitarian aid distributed around the world. We supported last year 100 million people in 40 countries, mobilising US $15 billion. And I think that the work the UN does is absolutely irreplaceable, and looking at World Food Programme, UNICEF, UNHCR, what is happening in the world would be - the tragedy would be much bigger without this work. So I think we have an added value that is proven but it's clear we need to accelerate in 2019. Accelerate in relation to climate change and we will have a summit in which we want more ambition in mitigation, in adaptation, in finance, and in innovation, and to make governments understand that they are not doing enough and to mobilise as much as possible the business community and the civil society; and that accelerate in relation to the perspectives of the agenda 2030 - this is the sustainable development goals - and create the conditions to mobilise the business community, to mobilise the civil society. We're not yet there. We maybe have, like a G20 composition, we also have the three powers of Russia, China and the US. You mentioned that, but in addition to a multipolar world decreasing more and more, because we are seeing also other countries more assertive than before, and if there is a vacuum, it will try to be filled. We have this notion of multi conceptual world. And that adds to the complications, because this is also seen as asking questions around human rights and - although agreements that we have had in the UN - the rules-based world order. When you look at human rights, look at gender, and the rights of girls for education in the world - that are crucial issues - some are saying "Oh, these are western values." But these are really universal values. I think it varies. But it is clear that, in general, we can say that we have witnessed - probably because governments feel weaker in relation to the solution of the problems that they face - we have witnessed in several parts of the world the national sovereignty agenda gaining ground in relation to the human rights agenda. And so it is clear that, in several parts of the world, we see the civil society space shrinking. We see media freedom being negatively impacted. And we see the expression of forms of authoritarianism or this new fantastic expression that was invented, “illiberal democracy”. This is clear. The human rights agenda is in trouble and we need to make sure that we mobilise the international community - and again the civil society has a key role to play in this - for human rights to be protected. Now, gender is different, in the sense that in gender I think we are witnessing a gigantic movement for gender equality, coming from the rank and file, from the society. We have many governments clearly in this direction. We at the UN are totally committed. We have reached gender parity at the level of the senior management group, and of our team leaders around the world. It's true, those are the ones I appoint directly, so it's easier to have gender parity; but even in the system, we have now a road map to reach full gender parity in 2028, with the agreement of member states. And I see in many other countries a lot of effort being done in relation to bringing girls to school, fighting genital mutilation, fighting early marriage. So there are a number of things that are happening. But it's not enough. But in general, I would say, the human rights situation in general is worse than what we are seeing in gender, where I see now some progress. In some areas, we are having a regression; in other areas, we have some progress, and I hope that in gender, we are making some progress. Of course, there is a long way to go. This is a male dominated world with a male dominated culture, and this is essentially a question of power, and we know that it's always difficult for power to be given. Normally, power has to be taken. You have to mobilise also the private sector, it is 75% of the global GDP. 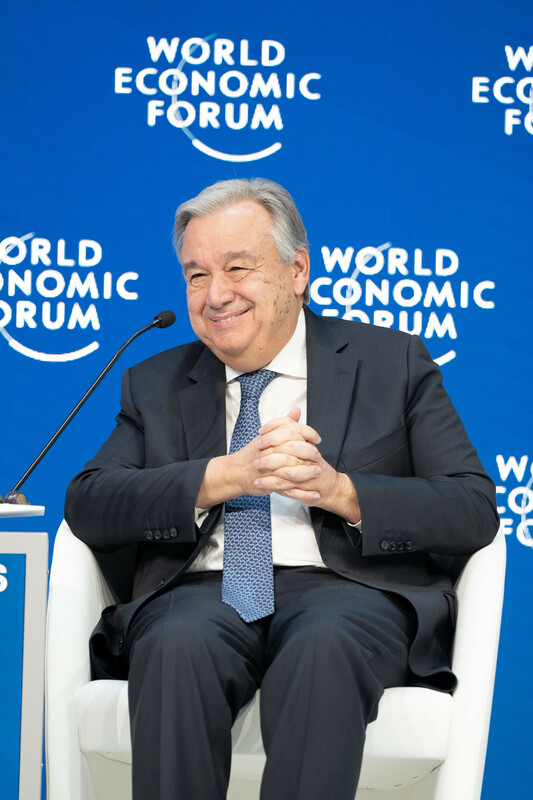 So moving forward, I think collaboration with business - and you have some of the key CEOs in the world here - is crucial when it comes to fighting climate change; but also, to meet sustainable development goals, eradicate all extreme poverty by 2030, and we're not on track on this. I think we need to have action on several fronts together. I've been talking to many financial institutions, for instance, about the need to support investments in many developing countries, and usually the answer is related to problems of governance, and the questions of corruption and others. So that is why one of the goals is exactly related to governance, to improved governance, improved capacity of member states - especially the least developed member states - to be able to attract private investment and to be able to have normal relations with private investment in the working of their economies. So we need to act with member states to create the conditions for adequate government, for a rules-based relationship with the private sector. We need to mobilise the private sector in order to invest in those countries. And we need - working with governments, with aid entities, and with the financial system - to find some new instruments or to increase the impact of instruments to reduce the risks of investment in many of these countries. And a lot is being done as you know in insurance, a lot has been done in relation to different forms of financing. Now we have the green bonds, we have social bonds. So a lot needs to be done to make sure that we are able to create the combination of these things. A welcoming environment in the least developed countries, a commitment of the private sector to invest, and the creation of a number of instruments to reduce the risks of that investment in order to make sure to address the huge gaps that we have in the development world in a large chunk of the least developed countries. We have now developments in areas like artificial intelligence, Internet of Things, drones, that are happening at an unparalleled pace. 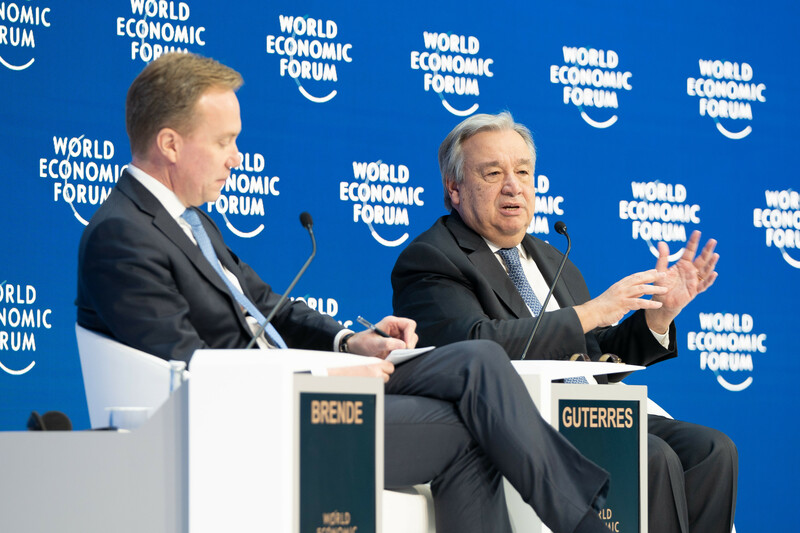 And you know also the World Economic Forum works on the Fourth Industrial Revolution and this morning I was with African leaders saying that “We lost out on the first, second and the third Industrial Revolution, but we're not planning to lose out on the fourth. We will have to leap frog.” And we also see that there is a big technological competition between the big nations and we know in a platform economy, the winner easily takes it all. How do you see the UN playing a constructive role here, that this Fourth Industrial Revolution can also be an inclusive revolution, and a revolution that gains all the population of this world? First, the impact of a Fourth Industrial Revolution with artificial intelligence as probably the leading role, the impact in the economies and societies will be huge. There will be a massive destruction of jobs and a massive creation of jobs. The problem is that they are not the same jobs and not requiring the same skills. And I think that the World Economic Forum has been doing a lot to raise awareness and to find solutions, but let's be clear: we need to mobilise much more governments and the business community and the civil society to understand what kind of impact are we going to have in the next decade and what kind of measures do we need to start taking now in order to respond to it? Educational systems - it doesn't really matter now how much you learn, how many things you learn. What matters is how you learn to learn. Because you will be doing completely different things in your life. The question of safety nets - a new generation of safety nets. So there is a lot that I believe the UN can be a platform for discussion, with the business community and governments, within the sustainable development goals discussion, in order to try to address the massive impact that the Fourth Industrial Revolution will have on societies and economies; and to try to prevent instead of react. And then, of course, the concept of work will change. The relation between work time, leisure, other occupations, will change. These are things we need to discuss much more in the international community and prepare for what's coming. Then there is a second level, in which we are now very much engaged with the high-level panel on digital cooperation. When I look at the web, it's clear that the web is a fantastic instrument for all of us. It's clear that we have the dark web and the deep web and all the problems of cybersecurity, etc. And the question of regulation is a very complex question in relation to this. My feeling is that there is no way to use the traditional mechanisms of intergovernmental regulations through conventions that are approved and then agencies that - no. I think that this is the kind of situation in which we need soft mechanisms. We need to bring together all stakeholders - governments, the business community, the scientific community, the civil society - and create mechanisms that allow for a permanent following of what's happening; for the consensus in creating some norms, some protocol, but not with rigid forms of bureaucracy of regulation; and creating with this the potential more and more for the web to be an instrument for good, and at the same time taking into account that the web is also a question that some governments are using from the point of view of violation of human rights, etc. So it is clear to me this cannot be only an intergovernmental process. There is a wind of hope that is blowing - and I think Ethiopia was crucial for this wind of hope - that is blowing in relation to the dramatic conflict situation we have in many parts of the world. And my intention is to intensify our surge in diplomacy for peace, and to enhance our partnerships with regional organisations. It is the case of the African Union, it is the case of regional Africa, it's the case of other parts of the world. And to do everything possible to bring a number of situations in which, until now, it was not possible to launch a serious political process, to bring those situations into a serious political process. Countries like Central African Republic, South Sudan, countries like Yemen, Libya, Syria with all its complexities, are countries where we would like to make huge progress next year. And then we have situations in which what I was saying about how everything is interlinked, are clear - that they require innovative forms of handling them. In the Sahel, you have conflict, you have terrorism, you have climate change impacting dramatically, you have huge problems of lack of development, and you have problems of governance that are very serious. So it's a whole area in which all these mega problems are combined. That is why we need this kind of multilateralism that is networking to address everything at the same time, and inclusive. Because this is the kind of area that proves that the systems that we have, that still are fragmented and not able to respond to the kind of problems that more and more we are having in the future, in which everything is interconnected, and all answers need to be comprehensive.